To create each of these different types of form layouts, we’ll use identical markup, but with different CSS rules. This HTML uses exactly the same fieldset-legend-label structure that we saw earlier in this chapter. However, you should see one glaring addition: inside the fieldset elements is an ordered list whose list items wrap around each of the form element/label pairs that we’re using. The reason for this addition? We need some extra markup in order to allow for all of the styling that we’ll do to our forms in this chapter. There are just not enough styling hooks in the standard fieldset-label structure to allow us to provide robust borders, background colors, and column alignment. There are a number of superfluous elements that we could add to the form that would grant us the extra styling hooks. We could move the form elements inside their label elements and wrap the label text in a span, or wrap a div around each form element/label pair. However, none of those choices would really contribute anything to the markup other than its presence. The beauty of using an ordered list is that it adds an extra level of semantics to the structure of the form, and also makes the form display quite well in the absence of styles (say, on legacy browsers such as Netscape 4, or even simple mobile devices). 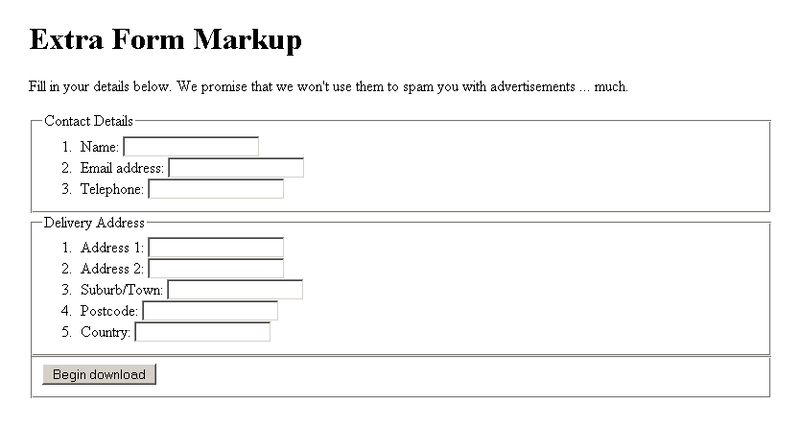 With no CSS applied and without the ordered lists, the rendered markup would appear as in Figure 6. Figure 7 shows how the unstyled form looks when we include the ordered lists. I’m sure you’ll agree that the version of the form that includes ordered lists is much easier to follow, and hence fill out. Using Lists in Forms If you’re vehemently opposed to the inclusion of an ordered list inside your form.markup, you can easily substitute it for some other wrapper element; all you need is one extra container around each form element/label pair in order to style your forms any way you want. Each form input has a class that replicates its type attribute, for example class="text" type="text". If you need to style a form element, this is a handy way of accessing it, given that Internet Explorer 6 and earlier don’t support CSS attribute selectors (although Internet Explorer 7 does, so you mightn’t need to include these extra classes in the near future). 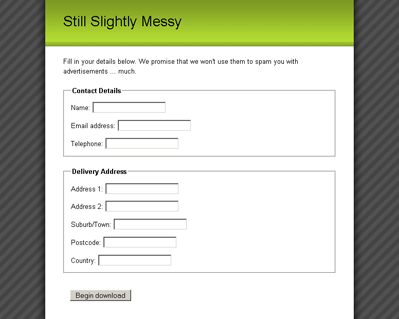 The form submit button is contained inside its own fieldset with class="submit." You’ll frequently have multiple actions at the end of a form, such as "submit" and "cancel." In such instances, it’s quite handy to be able to group these actions, and a fieldset does this perfectly. If any styles are applied to normal fieldset elements, you’ll most often want to have a different style for the fieldset surrounding these actions, so the class is necessary to distinguish our actions fieldset. The fieldset and the input inside it both have the same class name because the term "submit" makes sense for both of them, but it’s easy to distinguish them in the CSS by preceding the class selector with an element selector, as we’ll see below. The margin on the fieldset helps to separate each fieldset group from the others. All internal padding is removed from the fieldset now, because later on it’ll cause problems when we begin floating elements and giving them a width. Since padding isn’t included in the width, it can break the dimensions of your form if you have a width of 100% and some padding. Removing padding also helps to sort out inconsistencies between browsers as to the default internal spacing on the fieldset. To help define a visual hierarchy that clearly shows each label inside the fieldset grouped under the legend, we give our legend elements a font-weight of bold. We also have to replace the spacing that was removed from the padding on the fieldset, so we give the legend a margin-left of 1em. In order to turn off the natural numbering that would appear for the ordered list, we set list-style to none on the ol, and thus remove any of the bullet formatting that normally exists in such a list. Then, to recreate the internal spacing which we removed from the fieldset, we give the ordered list some padding. No padding is put on the bottom of the list, because this will be taken up by the padding of the last list item. To separate each form element/label pair from each other pair, we give the containing list item a padding-bottom of 1em. Finally, to remove the appearance of the submit button as a form element group, we need to take the borders off its surrounding fieldset. This step is achieved by targeting it using the fieldset.submit selector and setting the border-style to none. 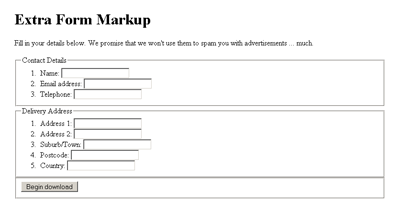 After applying all of this markup and adding some general page layout styles, we end up with Figure 8 — a form that’s beginning to take shape, but is still a bit messy. Now we can go ahead and add in some layout styles!